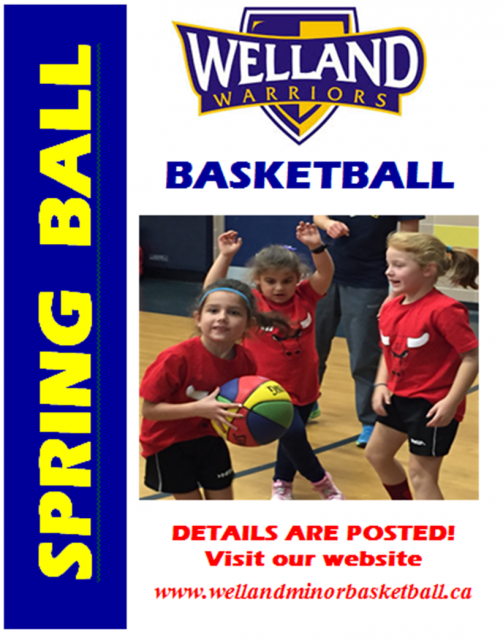 Updated Thursday March 1, 2018 by Welland Minor Basketball Association. Registration will close March 7, 2018, space is limited. There are three ways to register on-line, in-person or by mail. On-line registering, easy and available at your convenience, credit card required. WMBA House League is intended for boys and girls looking to start or continue their basketball endeavors in a fun non-competitive manner. Teaching proper fundamentals with age specific drills. To assure equal match ups whenever possible for positive development. Educate players to understand the rules of the game and basketball terminology. Encourage teamwork and fair play. The following programs are available based on age specific divisions. Requests to play outside of the player’s divison can be made. Session Date: Wednesdays 6:00 to 6:45 pm. The objective of this program is to introduce the player to the sport of basketball. The main focus is to develop Fundamental Movement Skills (running, jumping, throwing, catching). Games will be simple and fun using basketball equipment. Please Note: if numbers of players permit we will have teams consisting of all boys or all girls. Session Date: Mondays 6:00 to 7:15 pm. Equipment & Uniform - will include age-appropriate equipment (smaller basketball and lowered adjustable hoops). Session Date: Mondays 7:15 to 8:30 pm. The objective of this program is to further development fundamental movement skills, and basketball specific skills. This program is heavily based in skills, and is non-competitive with modified formal games. Session Date: Fridays 7:00 to 8:00 pm. A dark / white reversible is required and can be purchased for $25 if you need one. A basketball is required and can be purchased for $15.00 if you need one. The objective of this program is to continue improving sport specific basketball skills. Players will play 3 on 3 half court games. There are no skill sessions in this program. This is a fun game environment. Teams will be mixed each week to ensure everyone plays with all players. Games will have student referee. Session Date: Fridays 6:00 to 7:00 pm. The objective of this program is to continue improving sport specific basketball skills. Players will play 3 on 3 half court games. There are no skill sessions in this program. This is a fun game environment. Teams will be mixed each week to ensure everyone plays with all players. Games will have a student referee. Session Date: Fridays 8:00 to 9:00 pm. Session Date: Thursday 6:30 to 7:45 pm. The objective of this program is to continue improving sport specific basketball skills. Players will play 5 on 5 full court games. There are no skill sessions in this program. This is a fun game environment. Teams will be mixed each week to ensure everyone plays with all players. Games will have a student referee. Session Date: Thursday 7:45 to 9:00 pm. * Divisions are based on number of players, Time, date and location adjustments may be required. REMEMBER THE WMBA HOUSE LEAGUE IS INTENDED TO BE A LEARNING ATMOSPHERE WHERE YOUR CHILD HAS FUN!